​Day 1 (Sunday) Arrive at Kathmandu Tribhuvan airport and say Namaste to Nepal. After clearing customs and immigration, you’ll be met by our local team and taken straight to your arrival accommodation, a journey of under 30 minutes, depending on traffic. Arrive any time (6am to midnight) and our staff will be there to meet you with a warm welcome. Day 2-6 Activities and Sightseeing Week (Monday-Friday) Week 1 is a wonderful introduction to a wonderful country. 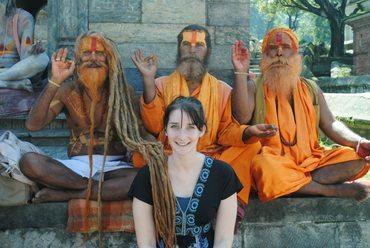 We’ll explore Kathmandu and its spectacular surrounding countryside, we’ll get acquainted with the local culture, language, religion, customs, history and social issues to deepen your understanding of the Nepalese way of life. Weekends Weekends are free to spend as you please. There’s so much to discover in Kathmandu itself, including famous Durbar Square and the hilltop Monkey Temple at Swayambhunath, whose giant Buddha eyes gazing out over the city are one of the iconic images of Nepal. The ancient Kathmandu Valley cities of Patan and Bhaktapur are easily accessible as a daytrip as are the Himalayan viewpoints at Dhulikel and Nagarkot. Day 9-13 (Monday-Friday) School time! The aim is education through fun and volunteers are encouraged to be creative with learning through books, games, songs, art, sport and music. All higher education in Nepal is in English, so it is vitally important that they learn the language well. 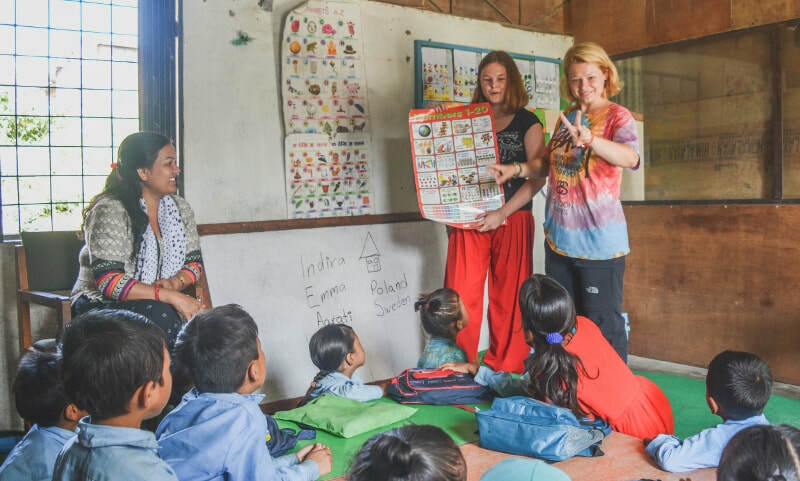 A classroom assistant from overseas is always the source of much excitement and interest, so you are encouraged to bring along photos, maps, pictures, books or educational games, from home. Volunteers with teaching experience and those without will both be able to make a very significant and worthwhile contribution here. Further weeks (Monday-Friday) follow the same structure as above. The longer you are here, the greater the impact you will have and the more comfortable you will become with life in the classroom. Your last day (Saturday) Your program finishes after breakfast on the Saturday of your final week. The team will be happy to help with a taxi to the airport or city hotel, just save some rupees for the fare - budget $10-15 for the airport, $5-8 for the city. Accommodation Volunteers will be accommodated in our volunteer house. It is around 5kms from the city centre, easily accessible, and a supermarket and ATM are only 15 mins walk away. Volunteers share a bunk-style room with three to five others, and bathrooms are shared. Rooms are lockable and there is wifi access, a mini library, a lounge area and a beautiful garden to relax. Meals Three meals a day are provided on weekdays and two meals on weekends. Expect a mix of Western and Nepalese food, consisting mainly of vegetarian dishes including rice and vegetables with a chicken dish about once per week. Kathmandu sits at an altitude of 1,400 metres, and temperatures always vary widely but generally the days are warm and the nights cool. Monsoon rains come in the hottest part of the year, the northern summer, with July and August being the wettest months. The clearest skies and coldest nights are in winter, with overnight temps during December to February often getting down close to zero. Don’t worry about under-packing for Nepal – you could quite safely come with no clothes at all and be kitted out cheaply in a matter of hours !